Cleveron’s delegation accompanied President of Estonia Kersti Kaljulaid on her visit to the United States. Cleveron’s visit goal was to participate in the Baltic-USA Business Forum to find new possible business opportunities in the USA. Presidents of Estonia, Latvia, Lithuania and President Donald Trump discussed co-operation between the states in the sphere of security and economy. President Kaljulaid emphasised at the press conference that at while the scales of economies of the two countries are very different, both distances and sizes become negligible in a digital world. She pointed out the cooperation between Cleveron and Walmart as an example of the successful business partnerships already ongoing between Estonian and U.S. companies. President Trump hosted the Baltic leaders and their business delegations at the Baltic Business Summit. 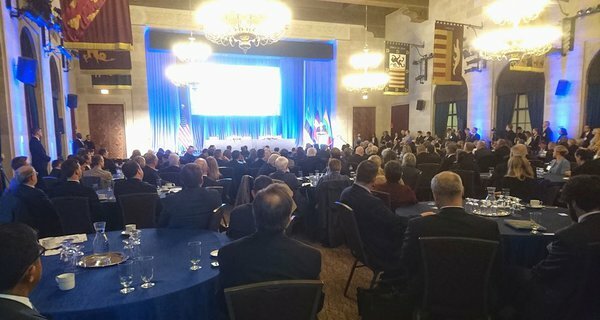 The event explored ways to encourage greater trade and investment ties and showcased success stories of U.S. investment in the Baltics. In his keynote address, the U.S. Secretary of Commerce Wilbur Ross also talked about the strong commercial ties between Estonia and the USA and pointed out the Cleveron-Walmart partnership as one of the success stories. During the summit, Cleveron’s delegation met with several U.S. corporations like UPS and KC Group at the Forum and discussed possible future collaboration. Active co-operation was also discussed with the Estonian honorary consuls in the United States. The visit and the business forum highlighted the commercial and economic relationships between Estonia and United States and Cleveron is thrilled to be a partner in this growing cooperation.